AESOP (Gr. Aisopos), famous for his Fables, is supposed to have lived from about 620 to 560 B.C. The place of his birth is uncertain - Thrace, Phrygia, Aethiopia, Samos, Athens and Sardis all claiming the honour. We possess little trustworthy information concerning his life, except that he was the slave of Iadmon of Samos and met with a violent death at the hands of the inhabitants of Delphi. A pestilence that ensued being attributed to this crime, the Delphians declared their willingness to make compensation, which, in default of a nearer connexion, was claimed and received by Iadmon, the grandson of his old master. Herodotus, who is our authority for this (ii. 134), does not state the cause of his death; various reasons are assigned by later writers - his insulting sarcasms, the embezzlement of money entrusted to him by Croesus for distribution at Delphi, the theft of a silver cup. 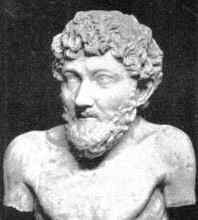 It is probable that Aesop did not commit his fables to writing; Aristophanes (Wasps, 1259) represents Philocleon as having learnt the "absurdities" of Aesop from conversation at banquets) and Socrates whiles away his time in prison by turning some of Aesop's fables "which he knew" into verse (Plato, Phaedo, 61 b). Demetrius of Phalerum (345-283 B.C.) made a collection in ten books, probably in prose (Lopson Aisopeion sunagogai) for the use of orators, which has been lost. Next appeared an edition in elegiac verse, often cited by Suidas, but the author's name is unknown. Babrius, according to Crusius, a Roman and tutor to the son of Alexander Severus, turned the fables into choliambics in the earlier part of the 3rd century A.D. The most celebrated of the Latin adapters is Phaedrus, a freedman of Augustus. Avianus (of uncertain date, perhaps the 4th century) translated 42 of the fables into Latin elegiacs. The collections which we possess under the name of Aesop's Fables are late renderings of Babrius's Version or Progumnasmata, rhetorical exercises of varying age and merit. Syntipas translated Babrius into Syriac, and Andreopulos put the Syriac back again into Greek. Ignatius Diaconus, in the 9th century, made a version of 55 fables in choliambic tetrameters. Stories from Oriental sources were added, and from these collections Maximus Planudes made and edited the collection which has come down to us under the name of Aesop, and from which the popular fables of modern Europe have been derived. A collection of over two hundred moral-based fairy tales.